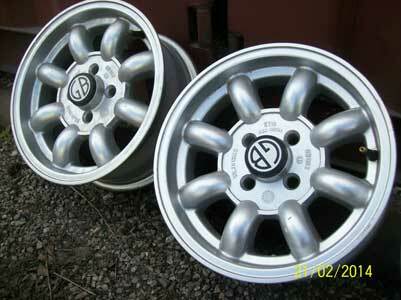 The original wheels were discarded in 1980 when wider 5½J x 13" Dunlop steel wheels were purchased. As these are now rusty, I decided to get some 'Minilite' type wheels as these are popular and they suit the GT6. 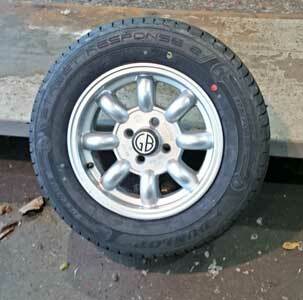 Luckily I obtained some GB wheels (which are period to the car) from EBay. Original Minilites were made by a company called Tech Del Ltd, in Magnesium Elektron C alloy from around 1966. When the original Tech Del Ltd. were still making their very expensive "Minilite" magnesium alloy wheels, there was a huge demand for something that looked similar but cost less and was more suitable (less prone to corrosion) for the road. The first Minilite copy was the "GB" alloy; this looked similar but was subtly different. 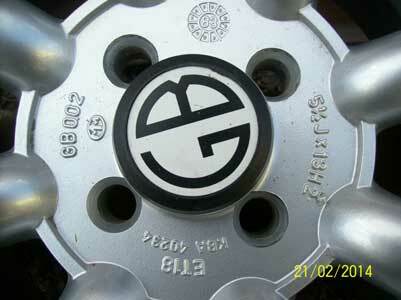 The manufacturers of GB alloys were sued for copyright infringement by Tec Del as the GB alloy appeared to be a copy of their Minilite wheel. The manufacturers of GB alloys won the case, not least due to the fact that they pointed out that the Minilite wheel was a copy of the 'Rose Petal' wheel, originally manufactured by John Cooper Garages and fitted to the Works racers as well as most other successful racers in the mid 1960's. They were a copy of the wheels made for the Cooper Grand Prix cars. Shortly after suing GB, Tec Del went out of business. Current 'Minilite' wheels are made by a company also called Tech-Del, which is not connected to the original company. "GB" wheels are now sold by John Brown Wheels, but they are not the same, or as good as the originals! I originally intended to fit Yokohama tyres as they are well regarded and a popular choice for GT6 owners. However as a former employee of Dunlop I have a soft spot for this once great British brand and my GT6 was fitted with Dunlop SP68 tyres when new, so it's appropriate to keep the same brand!. These modern Dunlops are made in Thailand and although the original company no longer exists, the "brand" now belongs to Goodyear. However on reading excellent reviews of these "Streetresponse2" tyres which rated them highly, I decided to fit these. One of these tyres can be seen left, after just being fitted at Hoole Tyre & Exhaust Centre.